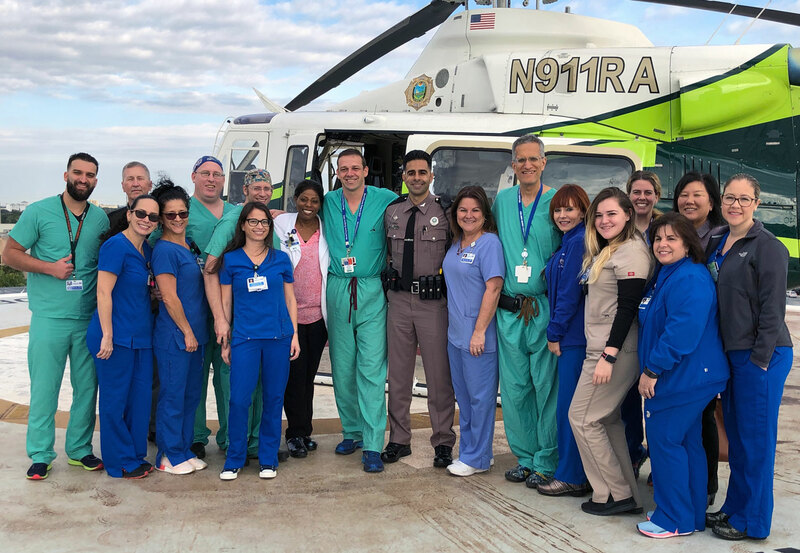 Trooper Carlos Rosario with members of the trauma team who saved his life. For out stepped Florida State Trooper Carlos Rosario, in full uniform, 22 months after having been flown there in the same helicopter with life-threatening injuries. It was Rosario’s first day back on duty, and he had come to thank the team that had saved him. On March 17, 2017, Rosario, then 40 and a 12-year veteran of Florida Highway Patrol Troop E, was participating in a speed-related traffic stop. Standing on the shoulder of the Dolphin Expressway, he was struck by a car whose distracted driver was texting while traveling 75 miles per hour in a 55 zone. Rosario was thrown against the side of one of the cruisers parked at the site. He suffered a traumatic brain injury, severe facial lacerations and fractures from his head to his feet. In critical condition and bleeding heavily, Rosario was flown to the Ryder heliport, where his trauma team was waiting. Daniel Pust, M.D., assistant professor of surgery, was the trauma surgeon on call that day and immediately took charge. Also in the building was Carl I. Schulman, M.D., Ph.D., professor of surgery and the officially appointed surgeon for Troop E. When he received word from Troop E that one of their own had been brought to Ryder, he rushed downstairs to help with Rosario’s initial treatment. “In the early stages, there were many times when Carlos could have died, and we put forth a real team effort to make sure that didn’t happen,” Dr. Schulman said. 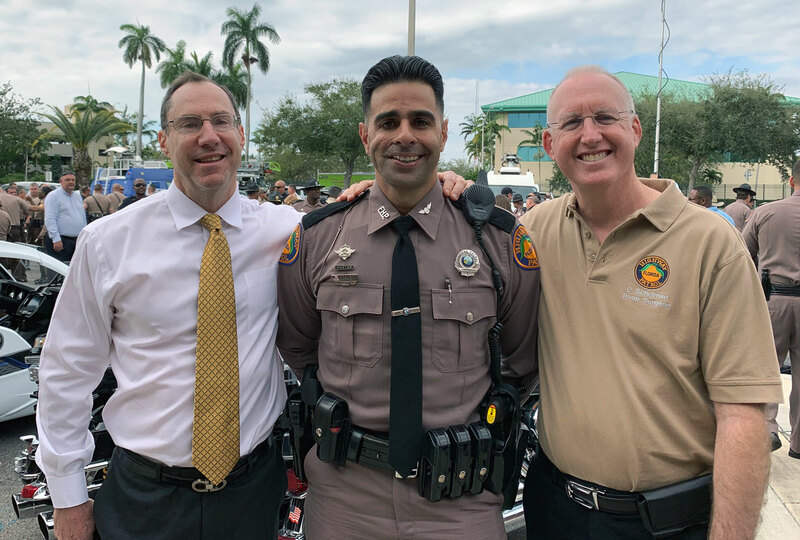 Trooper Carlos Rosario with Daniel Pust, M.D., the surgeon who was on duty when he was brought to Ryder Trauma Center. Rosario was in a coma for 17 days, finally waking up on April 3. Nine days later, on April 12, he was transferred to Ryder’s rehabilitation center, where the beginning of his recovery was supervised by Gemayaret Alvarez, M.D., assistant professor of physical medicine and rehabilitation, and Ryder’s medical director of neurorehabilitation. Dr. Alvarez credits Rosario’s motivation and his support network with helping him make a relatively quick and impressive recovery. On May 19, Rosario was transferred to another comprehensive rehabilitation facility — Encompass Health Rehabilitation Hospital of Miami, formerly Health South, which has a relationship with UHealth — where his continued recovery was overseen by David S. Kushner, M.D., clinical professor of physical medicine and rehabilitation. “Carlos was still very impaired when he arrived here, but as he had at Ryder, he demonstrated the strength and determination to recover,” Dr. Kushner said. Rosario had multiple surgeries to repair the damage to his face, to insert supporting rods in both legs and, at Bascom Palmer Eye Institute, to repair the cause of the double vision that plagued him for more than a year after he was struck. When he was finally released to go home on August 22, he was able to walk on his own and go up and down a staircase using a handrail. After that, it was just a matter of time and letting his body continue to heal. From left, David Kushner, M.D., trooper Carlos Rosario, and Carl I. Schulman, M.D., Ph.D.
Rosario, a dedicated sports fan, also had his spirits bolstered by souvenirs and keepsakes his friends arranged to have sent to him by teams all over the country. A Massachusetts native, Rosario was especially thrilled to receive a signed jersey from New England Patriots quarterback Tom Brady. Florida Governor Rick Scott surprised him with two visits while he was hospitalized, and a GoFundMe account set up by his friends enabled him to supplement the workers’ compensation payments he received during 22 months out of work. From the time he first woke up, Rosario’s focus was on returning to work — something his caregivers hoped for him but were reluctant to promise. Still, on January 9, he made that return to full duties. 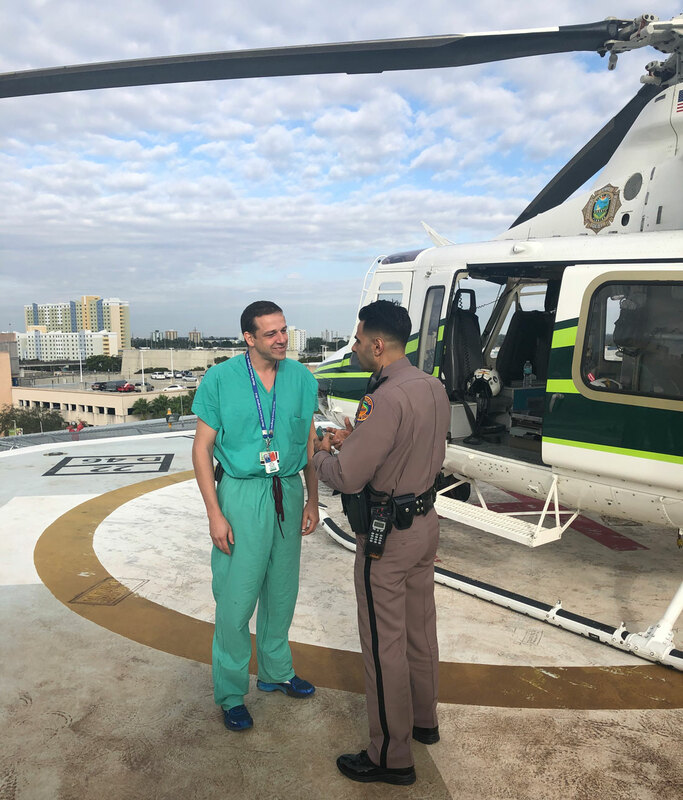 After thanking the trauma team at Ryder, Rosario climbed back into the helicopter and was flown to Troop E’s headquarters, where he was met by Dr. Kushner, Dr. Schulman, and a large complement of his fellow troopers for a celebration and a press conference.